Estimate: Estimate parameters for realignment. quality: Highest quality (1) gives most precise results, whereas lower qualities gives faster realignment. sep: The separation (in mm) between the points sampled in the reference image. Smaller sampling distances gives more accurate results, but will be slower. fwhm: Full width at half maximum of the Gauss smoothing kernel (mm). rtm: 1 indicates images are registered to the mean image, while 0 indicates images are registered to the first image in each subject’s folder. wrap: 3 dimensions of wrapping, e.g. [1 1 1] for wrapping in X, Y and Z direction, [0 0 0] for no wrapping. interp: Indexes of interpolation methods. (1 for Trilinear; 2-7 for 2nd-7th Degree B-Spline). which: The first parameter allows 0, 1 and 2 as input (0: create only a mean resliced image; 1: don’t reslice the first image. 2: reslice all the image). The second parameter indicates whether to output a resliced mean image (0 for false and nonzero for true). 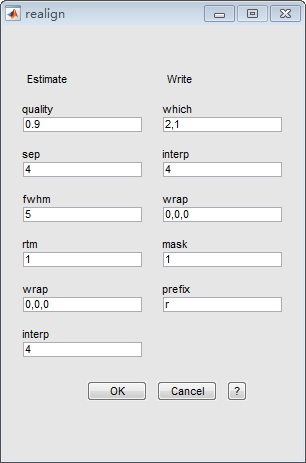 interp: Interpolation methods for write option. (0 for Nearest Neighbor; 1 for Trilinear; 2-7 for 2nd-7th Degree B-Spline; Inf for Fourier Interpolation). mask: Mask output images (true/false). If any image has a zero value at a voxel, then all images will have zero (or NaNs if allowed) values at that voxel. prefix: Output images will have a prefix of r by default.